The adidas Runners City Night race is a 5km or 10km run or 10km skate through the dark streets of Berlin. Supported by adoring fans, up to 10,000 people will be pounding the streets. Music, lights, drums, glow sticks and of course great costumes all make for an awesome atmosphere. To celebrate the event and come together, we welcome anyone to come and run with our team and friends. 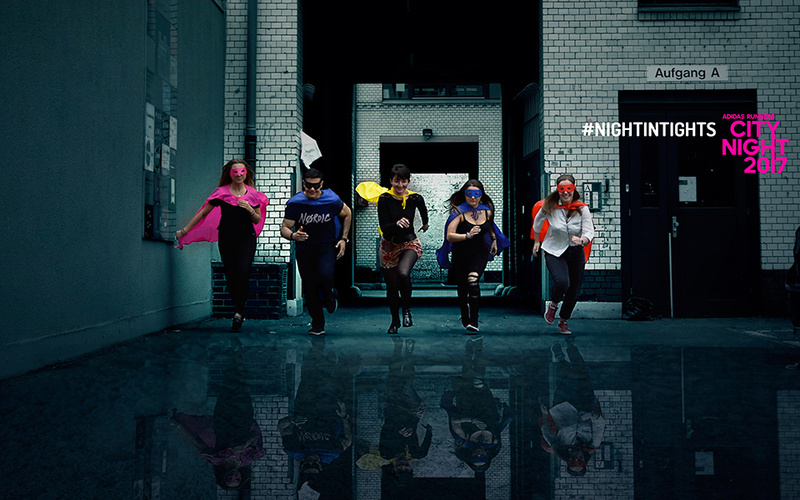 Dressed together as superheroes, we will rule the night. In a city that really never sleeps, we will also be joining the adidas runners crew at RunBase to keep the party going. All abilities are welcome and we are running at both distances. Everyone who dresses up and runs with us will get one of our brand new t-shirts to wear at the party. It’s black, so Berlin. Is Adidas City Night Run your next challenge? We hope so. Racemappr is inspiring everyone to discover their next sporting challenge. Based around simplified search, people can discover local finishline events such as runs, triathlons, OCR events and more. More than a listing site however, Racemappr connects event organisers and the race community, allowing them all to share, via profiles, their race and training experiences and continue to inspire each other. With over 5500 events in the UK and Germany so far, we are growing from grassroots communities and clubs into a global platform. And thank you Jon for sharing your story with us. We're bringing together the race community to help share and inspire people to discover their first or next challenge. Explore Racemappr to find and follow other personal journeys and share yours with the community too. Also add your thoughts on this article in the comments below. We really hope you can come and join us! !